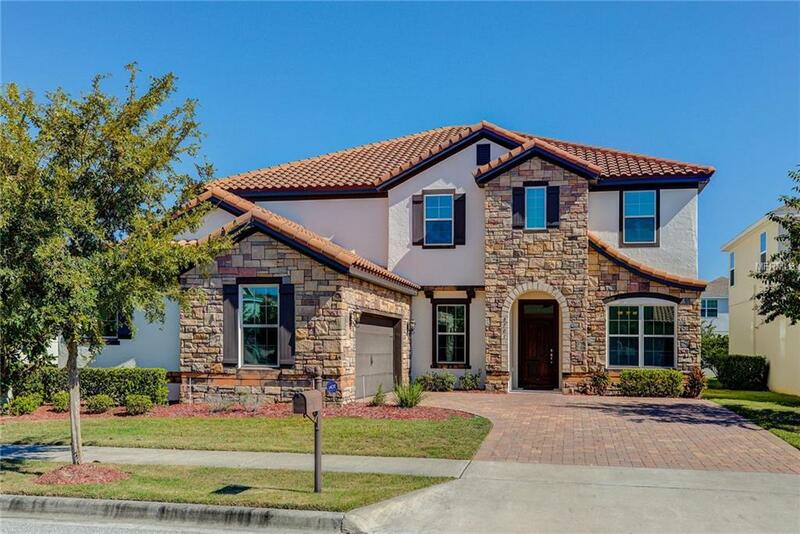 Fantastic newer construction Meritage home in the wonderful community of Windermere Trails. Completed in 2014 this spectacular Meritage home welcomes your arrival with pavered driveway and stone facade. The interior features plenty of natural light that illuminates the contemporary and functional open floor plan. The spacious kitchen features stainless steel appliances, granite counter tops, and large island perfect for entertaining friends and family. The Kitchen flows seamlessly into the dining nook and large family room which is complimented by a multi-purpose bonus room that can be used as game room, media room, etc. Just off of the family room is the covered lanai and fenced in back yard, a great place for summertime grilling and family cookouts. The Master bedroom includes walk-in closet and large master bath with jacuzzi style tub and separate walk-in shower. Located in Windermere and 2 miles from Disney Attractions, this ENERGY STAR Certified home features 6 Bedrooms, 5.1 Bathrooms. Windermere Trails offers residents a Community Pool, Cabana, Dog Parks w/ Wash Station, Playground and Exercise Area. Seller offering painting credit of $7000 with full price offer.